Are you into contemporary interiors? Give an ultra-personal touch by printing your favourite photo on Plexiglas. The Plexi is a luxurious option that enhances the colours of your photo, giving the image brilliance and depth. Professional photographers often use this very trendy backing to display their work. This involves a Lambda photo print fixed between two sheets of Plexi. A mounting system is provided on the reverse for invisible wall-mounting. 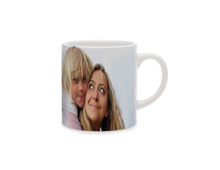 Creating your photo on Plexi takes only a few minutes. All you have to do is choose your photo. *Lambda printing is considered to be the most advanced digital technology for producing images on silver nitrate paper from a digital file. Lambda prints produce photos of unrivalled precision, continuous tones and a natural colour finish. Your portrait photo on Plexi. The Plexi is available in an original, trendy square format. Your Photo on Plexi to your measurements. Your photo split across several Plexis. Make an impact!